Check out the The New York Times Magazine in this Sunday’s paper for a cover story called The Kings of Maine. The text is online at this link, but there may be more pictures in the print version. The author of the interview also posted a sidebar on the Times site: An Easter Egg Hunt With Stephen King and Family. King will be making three stops on his book tour for Doctor Sleep. First, he’ll appear with his son, author Owen King, in New York City on September 24th at 7:30 PM, presented by The Center for Fiction at the Gerald Lynch Theater at John Jay College. Then he’ll be at the Colorado Chautauqua Auditorium in Boulder on Wednesday, September 25th at 7:30 PM. His final appearance is an event hosted by Harvard Book Store at 7 PM on September 27th at the Memorial Church, One Harvard Yard, in Cambridge, MA. See King’s official web site for links to the various sites and the full details of each event. Under the Dome has been a big hit for CBS. Factoring time-shifting viewers and people downloading it on Amazon, more than 15 million people have been tuning in. Last week, CBS announced that they are renewing the series for a second season. The first episode of the 2014 series will be written by King. A lot of people have been complaining about how much the series diverges from the novel. King addresses these complaints here. On CBS Sunday Morning, King took the producers to the Maine town that was the inspiration for Chester’s Mill: Stephen King and his compulsion to write. And this was pretty funny: On David Letterman, Bruce Willis joked that he was joining the series, playing “the guy who lives right next door to the dome.” Because of the realities of filming outdoors, the producers have had to make some concessions about the weather. 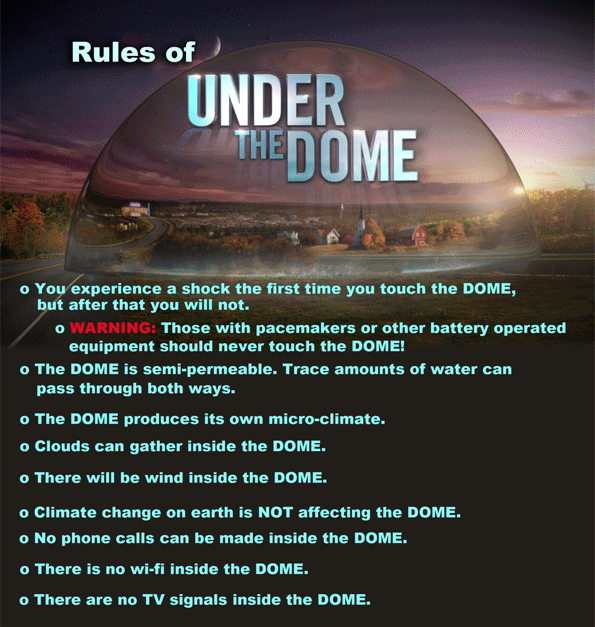 It’s impossible, for example, to eradicate the wind, so they published the rules of Under the Dome. Here is a report from King’s recent appearance at Mark Twain House and a video of the event. In an interview with The Atlantic, King discusses why he spends “months and even years” writing opening sentences. The AARP website has posted an excerpt: Stephen King’s Doctor Sleep Revisits The Shining — Nearly 30 Years Later. During the premiere of Under the Dome, CBS ran an ad for the book. NBC has announced plans for a miniseries remake of The Tommyknockers. Emmy Award winner Yves Simoneau (Bury My Heart at Wounded Knee) is attached to direct. After years of being unavailable, The Golden Years is once again on DVD and Blu-Ray. This week, Marvel starts shipping out the first issues of The Stand and Treachery, the third cycle in the Dark Tower series. UGO has a six-page preview of The Stand at their web site. Here is an interview with artist Mike Perkins. King reviews Suzanne Collins’ The Hunger Games in the current issue of Entertainment Weekly. The October issue of Fantasy and Science Fiction magazine containing the new King story “The New York Times at Bargain Prices” is on news stands now. Filming is now under way in Tipton and Wilton, Iowa and other locations in the Quad-City area for the remake of Children of the Corn. Among the cast: David Anders (Heroes), Kandyse McClure (Battlestar Galactica) and Daniel Newman as Malachai. The film is scheduled to wrap at the end of September and will premiere on the Sci-Fi Channel next year. Two newish books that might be of interest to you. The Films Of Stephen King, edited by Tony Magistrale is the first collection of essays assembled on the cinematic adaptations of King’s work. Chapters are written by cinema, television, and cultural studies scholars. Haunted Heart: The Life and Times of Stephen King an unauthorized biography by Lisa Rogak will be published in January 2009. In the introduction to his first collection of short fiction since Everything’s Eventual (2002), King credits editing Best American Short Stories (2007) with reigniting his interest in the short form and inducing some of this volume’s contents. Most of these 13 tales show him at the top of his game, molding the themes and set pieces of horror and suspense fiction into richly nuanced blends of fantasy and psychological realism. “The Things They Left Behind,” a powerful study of survivor guilt, is one of several supernatural disaster stories that evoke the horrors of 9/11. Like the crime thrillers “The Gingerbread Girl” and “A Very Tight Place,” both of which feature protagonists struggling with apparently insuperable threats to life, it is laced with moving ruminations on mortality that King attributes to his own well-publicized near-death experience. Even the smattering of genre-oriented works shows King trying out provocative new vehicles for his trademark thrills, notably “N.,” a creepy character study of an obsessive-compulsive that subtly blossoms into a tale of cosmic terror in the tradition of Arthur Machen and H.P. Lovecraft. Culled almost entirely from leading mainstream periodicals, these stories are a testament to the literary merits of the well-told macabre tale. The publication date for King’s upcoming short story collection Just Past Sunset (ISBN-10: 1-4165-8408-0) is November 11, 2008 in the US and UK. The book will have approximately 400 pages and has a cover price of $28. Though the list hasn’t been finalized, here are the stories that are confirmed for the collection: The Gingerbread Girl, Harvey’s Dream, Rest Stop, Stationary Bike, The Things They Left Behind, Willa, Graduation Afternoon, N, The New York Times At Special Bargain Rates, Mute, Ayana, A Very Tight Place. One unnamed “bonus” story might be added to the list. I’ve never heard of “N” before. Look for a new three-part interview with King later this week at Lilja’s Library. Bravo in Canada is airing the one-hour show An Evening With Stephen King on Thursday at 9 pm EST. “Recently honoured with the Canadian Booksellers Association’s Lifetime Achievement Award, King is the first non-Canadian to receive the honour. BookTelevision’s cameras were there to record the historic evening. Authors Margaret Atwood and Clive Barker toast this literary legend, and pop culture writer and essayist Chuck Klosterman interviews King one-on-one. In his heartfelt acceptance speech, King pays tribute to many Canadian writers who have made an impact on his life.” The show does not appear on the US Bravo schedule.